Alnitak or Zeta Orionis is a system of three great blue stars. The biggest, Alnitak Aa, with a surface temperature of 40 000 kelvin is the brightest O-star in the sky. A dim fourth star (with 9th visual magnitude) is next to the triple. It is not sure whether it belongs to the system too. 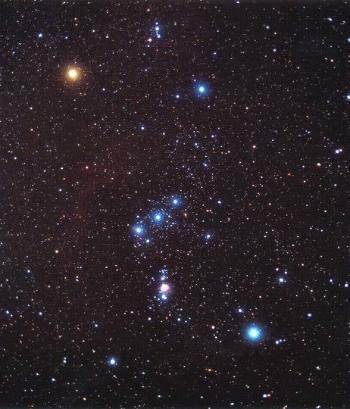 The left belt star of Orion lies visually next to the famous Horsehead Nebula. Orion. Left in the row of three is Alnitak, the central is Alnilam and the right one Mintaka. In the upper left is Betelgeuse, up right is Bellatrix, down right Rigel and down left Saiph.